The folks at Murphy’s have let us know they’ll be hosting their Seventh Annual Christmas Tree Lighting & Neighborhood Celebration this Thursday December 5th from 6:30 – 7:30 PM. You’re invited to come join your neighbors in listening to – and singing along with – Christmas carols performed by the Georgia Boys Choir. There will be plenty of complimentary hot cocoa and fresh baked cookies to help warm things up a bit. Even Santa won’t miss this event so you’ll want to stop by for sure. Murphy’s is located at 997 Virginia Ave., next door to Taco Mac. 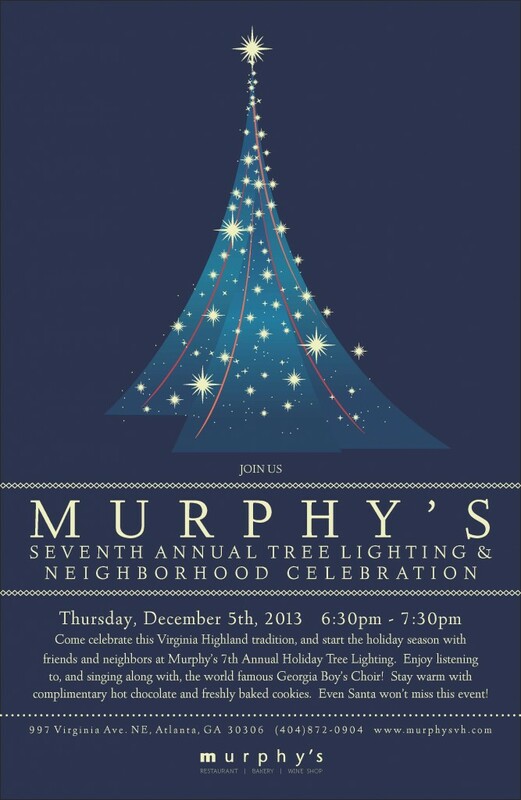 This entry was posted in news and tagged 2013, christmastreelighting, murphys by John Becker. Bookmark the permalink.